The bible teaches us to spare not the rod, that your children need to be disciplined. When I am referring to discipline, I am not talking about abuse. I do not condone or advocate abuse in any way. It is not right to abuse your children and if you abuse your child, you need to STOP! First you must remember that you are the parent and in charge. You are not your child's friend or buddy. That is where some parents err. You cannot earn your child's respect if you are trying to put yourself at their level. No pleading! I have seen parents do this and they are creating a monster. Also, you must be consistent with your discipline. If you are wishy washy, your children will quickly pick that up. Even at a young age. If you say that they are going to sit time out or get a spanking, then do not make a liar out of yourself. Your child will quickly learn that you don't mean what you say. No yelling either. You need to be gentle and firm, and quickly set the guidelines down of who is in charge. They will learn your stern, quiet tone of voice means business. When disciplining your children you have to set boundaries. Be very plain in what you expect of them and what the consequences are if they do not obey. It is also good to reward them for good behavior. You have to have a balance. Don't dwell on negative, you must reward positive behavior too. One way is to have a chart up and let them earn behavior stars. If they get so many, they earn an ice cream or some other treat. Or if you have taken something away, you can also use this method for them to earn privileges back. This reward system worked very well for my boys. Children really do want to please you. You just need to figure out what motivates your child. These are some methods that I have used that have worked for our family. Parenting is a everyday battle, but I promise, if you discipline your children young, you will not have to discipline them much when they get older. Parenting is so much more rewarding when you have children that behave. But are you up to the task? Do yourself a favor and discipline your children. 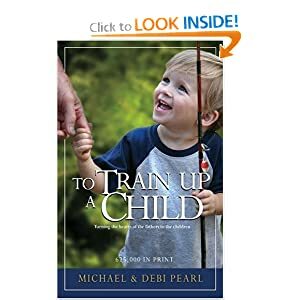 Here are two excellent books for the raising of your children. They are great books that I have personally read. Praying with you for stronger families! I always enjoy reading your posts! Great work! I wanted to let you know that I am featuring Notions from Nonny at this week's Harvest of Friends Weekend Blog Hop. Thank you for all of your participation at Our Everyday Harvest! Have a great weekend! Stopping by from What's Cooking in the Burbs to return the follow. I look forward to reading more of your blog. Have a great weekend! Stopping over from Hope Whispers and following back :) Great post. My boys are more afraid of getting their Nintendo taken away than a spanking, but they know that if I say I will spank them, I mean it! Glad to have found you! Thank you for the wonderful article. We are struggling with a very willful three year old son. He is very trying. I think I will buy the books you mentioned. Thank you for the follow at This Southern Girl's Life. I am following you back. Hope you are having a great weekend.